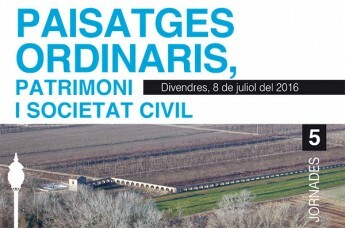 Home > The Museum > Press > Symposium "Ordinary landscapes, heritage and civil society"
Symposium "Ordinary landscapes, heritage and civil society"
The National Museum of Science and Technology of Catalonia (mNACTEC), in Terrassa (Vallès Occidental), will be the venue on Friday, 8 July, for the symposium "Ordinary landscapes, heritage and civil society", jointly organised with the Landscape Observatory of Catalonia. Registration for the debate is free of charge, via the Museum's website. The session will serve to highlight landscape elements that are not catalogued and often go unnoticed, but nonetheless form a part of the history and distinct identity of individual locations.